The account of a journey to build a country life! Sorry I have been so remiss in posting this blog. 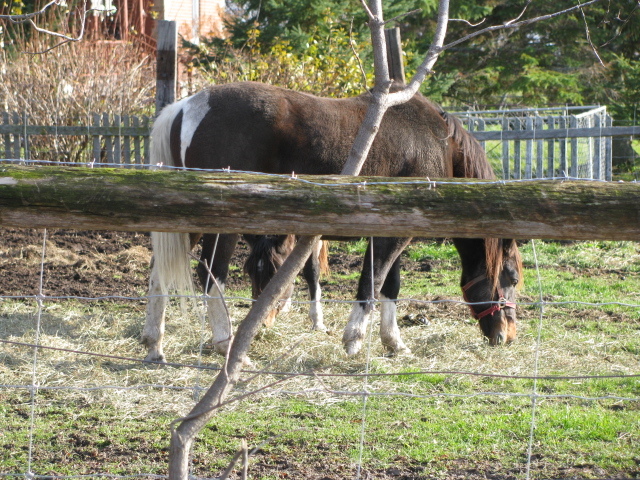 I confess I had my last day at the barn Sunday, November 28, 2010 but haven't been able to update my blog because we were trying to tweak some video I had taken but unfortunately I have been unable to upload it so I am proceeding with just the pictures. When we arrived at the barn that Saturday it was bitterly cold and windy and I confess I was feeling so over this barn demo. The objective? Remove the roof of our barn. CAT had decided that whether or not we could get the logging truck in there, he was taking it down. Honestly, I sat almost the whole day in the Jeep because it was so bitter but CAT was on a mission and there was no stopping him. His plan was to take the ladder up into the hay mow and poke through the roof on the cedar side and then remove the boards from the rafters. You can see the top rungs of the ladder peaking out near the top of the roof. Through and removing boards at a rapid rate. Almost done the one side. A closer look at the way the rafters were hand hewn into the upper log. Most of these rafters are too old to be re-used and would likely not be up to code so CAT will be building new rafters for our barn. Maybe a gambrel roof instead. He then detached the lower section of metal roof and slid it off...you can see it sliding above. Here you can see the lower section of metal roof has slid off. This is where CAT realized there was no way he could detach the rest of the roof this way and he decided to lay it down. The roof after CAT collapsed it. A cozy spot we cleaned up a bit. The view out toward the field again. 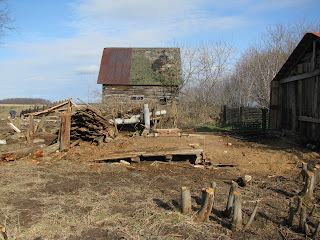 We didn't get a lot of demolition done yesteday at our barn. When we arrived it was insanely windy and the end pieces of the metal roof on our barn, where we had removed the hanging piece, had been flapping in the wind and were loosening. With it being so windy if they were to tear off they could potentially go flying to the neighbours where they keep horses. The two horses in the pic below have been our companions as we've worked away often taking off running when we've pulled down larger sections of barn. Loud noises didn't seem to bother them , such as the chain saw, but when something heavy hit the ground I guess they felt the vibrations and they'd take off. They were very curious the day we took down the machine shed as it was attached to their covered area so once it was down they were over to pass judgement. I'm not sure what they were thinking though, they just looked it all over lol. Anyway, we certainly didn't want any flying projectiles hurting anyone so that was how we (read CAT) spent the first part of our day. Our companions to the south side of the barn property. You can see their red roofed covered area in some of the machine shed demo pics. ﻿ We did manage to clear out the remaining manger and here are some pics of our empty barn. If all goes well, once reassembled on our property I will gently pressure wash the inside and then I'm going to paint it with a Lime mixture to help brighten it up and also to help with disease resistance down the road for our animals. We noticed some remnant lime paint on the upper logs so I imagine at one time it was all limed. On our property this small door will face the tree line and will have a lean-to built over it. It will be a covered area for the goats for when it's raining and also this door will be our main door for access to the barn. This wall will face south on our property so we are going to add another window between the two upper windows to add more natural light. This large door will face the front / road of our property which is west and will be access to the front pasture for our sheep. I've asked CAT if we can put windows in the doors we build for this and we think we can, once again adding more natural light. Just another photo taken looking toward the small doorway. The most exciting part of our day was that the logging truck owners came to survey the site and to make a plan for picking everything up. We will have to wait for freeze up because the field is clay and is holding lots of water but other than that they felt everything should be fine and they quoted a great price for doing it. The farmer has to remove some stumps for us first (he has heavy equipment to do this) and remove the felled trees but other than that we are good to go. We aren't going to remove our roof until we know we can gain access because we'd rather the barn had it's roof if we have to wait until next summer for the logging truck to be able to get in there to do it. There's no sense in it being exposed to the elements all winter. That's all the barn demo news for this week. We may head to our property today to give the dogs a run and clean up some of the trees CAT cut along our property line. Have a great week! Working on our little barn at last! Well we are finally working on our little barn. We pulled down the hanging piece on the one end last weekend and then this weekend started pulling out the stalls from the inside. We took a break from the barns today (Sunday) to get the rest of the cedar posts from CAT's friend. These are the ones that are for what I call our "agricultural" fence. We are thinking one side of the property will be more residential and vegie/flower garden and lawn, while the other side will consist of pasture and barn (hopefully, fingers crossed) although we are now also thinking of fencing off part of the field in front of the house as well. It could be cut for hay or something could pasture there, maybe a male sheep if we are trying to keep him away from the females.....I am off on one of my dream tangents lol.....this is all a long, long way off. Anyway, check out the pics. We have been so lucky with weather. It has been warm and fairly dry both last weekend and this. All that is left of the old machine/drive shed is the pile you see on the left, the old antique rake and the old rotted floor boards. The farmer who owns the land is going to dispose of these remnants with his heavy equipment by moving them to a low ravine on his property where they can naturally decompose and the nails won't be an issue. You can see our little barn in the background and to the left side is the hanging piece of old barn that we have removed but not yet dismantled. Our barn again but without the hanging end piece. You can see how square it is. A glimpse of the one stall before we dismantled and removed it. It's hard to see but there is a manger on the left side that still had hay in it. I wonder what happened to the animals that they didn't even get to finish their hay? Here is a better pic of the manger...and look at the wicker chair we found in the barn on the left bottom side of the pic. This shot shows the manger on the other side (left) as well. They certainly are not the prettiest stalls I've ever seen but you wouldn't believe how well put together these structures were. I couldn't get anything apart with my crowbar...poor CAT had to do it all and when I tried to remove nails on some of the boards they wouldn't budge. It was like the wood was made of iron. We have started numbering our logs on the inside. I was a bit concerned when CAT first started painting because it was so bright but he assured me that what doesn't come off on its own when I pressure wash the logs we are going to paint over with grey paint. This is what the one side looked like after removing the stalls. We haven't finished the left side yet so I will add those next week once we've completed that one. Looking pretty clean. Soon all that will remain is the big barn and the tree over it and I don't think we are taking any of it - but you never know lol :). Just a reminder what it looked like before! You definitely can't see the hills in the background in this pic. Here are our agriculture cedar posts for our wire fence. We now have 100 posts so if we put them 12 feet apart we have approx. 1200 feet of fence - well we will once we get the expensive wire part of the fence lol. Here are the piles from the barn demo that we have moved with our trailer. The piles in back are 5 feet or higher to give you scale. Once the logging truck brings all our other posts and beams we will have quite a pile. I'm glad our property is big. I finally caught her once she was in the Jeep. ready to go home. The rest of the time she was on the move because you never know...a wild turkey, deer or even a bear may be out there needing to be discovered. Here is a pic of one of the trails we've started back through the treed part of our property. That's it for another while folks. Sorry this post was so long but I had to gab about two weekends worth of fun. We will be working on the stall on the other side of our barn next weekend and maybe the roof so stay tuned. We are so close to being done it's crazy. We aren't going to know what to do with ourselves once it is done. I welcome any comments or thoughts so please feel free to respond by clicking on the word "Comments" below. Things I wish I could do! 1. I wish I was the type of person who always said the right thing and who was witty and charming at social functions. This doesn't really fall under the self sufficiency exactly but I had to put it in. I confess I'm often awkward at social gatherings and usually tend to suffer from foot in mouth syndrome due to my nervousness. Part of this is lack of practise to be sure because my husband and I are not social people by nature. CAT often jokes with me after a get together because I sit there and worry about what I said to this or that person. He says I have an inferiority/superiority complex, inferior because I worry about every little thing I said and superior because I think people are actually discussing me and what I said lol! It would be so amazing to be the person who always says the right thing and is confident and well spoken. 3. I wish I was a better housekeeper. I know this is one that should be easy to make come true but for me it is a challenge. Part of the problem is physical in that I have a herniated disk in my back and vacuuming and mopping are extremely hard on the back, and part of it is that I work full time but mostly it's that I just don't like it. I love a clean house but not the process. 4. I wish I had stronger will power (stick to it power) whether it means that I am able to stop myself from eating dessert when I shouldn't or if it means I don't spend that extra cash I was supposed to be putting away for savings, I just wish I could make a plan and stick to it. I always seem to fall off the proverbial wagon too easily. 7. 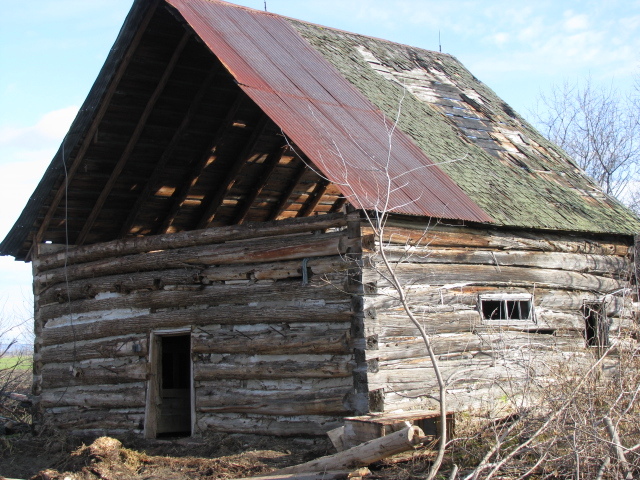 I would love to be able to build post and beam structures like the barns of yesteryear. For those who follow my blog you will know that we have been tearing down and cleaning up a few old barns circa the late 1800s. The mortise and tenon structures that they and a few neighbours constructed back then, with no power equipment to speak of, are a testament to the old ways. I find now, wherever CAT and I are driving, I am looking at all these old barns just falling to pieces in the fields and it saddens me that this skill is becoming as lost as the old barns themselves. Also add in the skill to build log structures as well since our barn we are moving is made with logs. 8. I wish I could grow enough produce from my garden that I could sell some at the local farmers market on Saturdays. This is a little dream that has been flickering in the back of my brain. I shopped several times this summer at one of our local farmers markets and although I would have preferred to be eating produce I'd grown myself, it was interesting to see the different vendors and even to meet some who are located close to our 5 acres. This will likely remain a dream since I work full time in an office but who knows, maybe we'll win the lottery and I can see the dream come true. 9. I can sew a little, and once I even managed to sew slip covers for our couch and loveseat (they've since worn out and have yet to be replaced) but I am no proficient and I would really love to be a talented seamstress. I would enjoy being able to slip cover any chair or sofa that I took a mind to or making some of my own clothes or clothes for others too. 10. Lastly I'd like to be able to take some of the old barn materials we've salvaged and build things with them like frames for mirrors/pictures or crafts such as wooden boxes. Maybe a wooden box with little sections in it for keeping individually wrapped teas (I've been wanting one of these myself) or what about spices (my calendar for November has this very thing on it with a few of the drawers labeled with this or that spice and then all the rest of the drawers labeled sugar lol). Well, I guess that is about all I can think of at this moment. I'm sure there are oodles more I could come up with. Traditionally, I would now tag others to complete the challenge but since I haven't yet had the time to expand the blogs I follow and I don't have too many followers to my blog yet, I will leave it at that and just put the challenge out to all who read this blog. Maybe you can just make your own mental list or better yet put some of your biggest and best wishes in the comments below. Thanks again to Leigh at 5 Acres and A Dream for thinking of me and for challenging me to focus on my wishes and dreams since what is life without a few wishes and dreams to chase. Cheers! Happy Halloween to all of you out in blog land. Bye, Bye Machine Shed - This is what the site looked like after CAT and I tore down the machine shed structure on Saturday, in the rain. We had a slight snowfall Sunday morning and I couldnt resist taking a picture of our little barn with the snow on the roof. I can only imagine how it will look once that sagging end piece is gone and it has a nice new metal roof and is sitting snugly on our property. I knowyou are probably sick of seeing the barn in photos but I cant help myself lol. This is what was left by Sunday at 3:00. We couldnt stay too late because we had to get home for the Trick or Treaters. It may not seem as though much changed but the large metal roof sections take time to tear apart. We were able to disassemble more than half of the roof plus we had a nice visit from the neighbour as well who gave us a bit of history about some of the old antique farm pieces hanging around and other local history - very interesting. These are Sandhill Cranes which CAT and I have been hearing but never seeing. As we were pulling out I noticed them out in the field. Very exotic. Well thats all folks for another week. We are almost done all that we can do by hand and are very close to actually working on our barn so stay tuned. As usual your comments are welcome and appreciated. I didn't have the gumption to post a blog of our last weekends work so I figured I'd better post something this weekend. We've completed the clean up of the large collapsed barn and we've been working on the machine shed structure. This pic is taken from the opposite side of the barn yard. There is nothing left now of the large collapsed barn. This pic is taken from the roadway. You can see the big barn on the left and then our little barn and the machine shed seem to be one structure but ours is in the background and the machine shed is in front. I have another shot from this angle later in the post and you can see our barn through the machine shed. Here is a closer look. He's crazy. I was having a hard time getting him to come down he liked it up there so much. Again, I think it reminds him of being a kid. Here is our little barn from the side you haven't seen yet. This side has double doors and you can really see the rafters well in this pic. Check out the wreath that is hanging on the barn just left of the doorway. Somebody once loved this little barn. You can really tell from this angle how square the barn is still. The round log ends you see are the floor joists for the hay loft above. Most of them are still in perfect shape. This is what the machine shed looked like by the end of the day. The timber frame is still in great shape and so we are going to try to get it down without damaging the mortise and tenon joinery and we are going to label and number this frame as well, perhaps to put up ourselves for a large workshop down the road or for storage for CAT's beloved trailer or maybe a camping trailer someday. I was trying to talk CAT into building a house with this but he wasn't biting lol. Lastly, here is a pic from the road again. You can see right through the machine shed now to our barn. The people that were supposed to be taking the big barn on the left, have failed to show up yet. Today we had a different project, since it was raining too hard to work on the barn. CAT had found some cedar posts from a friend, for our "agricultural" fence which we are putting down the one side of our property (we are having a split rail fence down the side closest to the house as mentioned in previous blogs) Our intent at this point is just to enclose our property perimeter but eventually we hope to have either a few sheep to graze this pasture or perhaps goats although we are thinking we would like the goats to help clean up the poplar seedlings and poison ivy in the back part of our property more than in the front. Of course with both sheep or goats we will need additional fencing to close in their pastures but for now it will be nice to be able to see our property lines. Our cedar posts for our agricultural fencing (page wire). The ones on the left are 9' long and the ones on the right are the 8'. We still have another load to get another day. Originally we were going to use these along with metal posts but the cost of the metal posts would be way more than what we could get these ones for so we will use these as much as we can. We do have several existing metal posts on old fencing already on our property so we will use these as well. Well, that's it for another week. Thoughts?